The word came down not so long ago from Roger Goodell's mountaintop: Saints middle linebacker Jonathan Vilma will sit out the whole season, and end Will Smith misses four games. Ex-Saint tackle Anthony Hargrove, now with the Packers, gets eight games, and Scott Fujita, now on the Browns, gets three. According to the NFL's press release, Vilma offered $10,000 bounties for anyone who knocked out either Kurt Warner or Brett Favre in the 2010 NFL playoffs, while Hargrove participated in the pool and later obstructed the NFL's investigation. Fujita and Smith pledged bundles of money to the pool, the NFL says. The players are appealing. The union says it still hasn't seen any of the evidence against them. But we doubt those appeals will go well. Roger Goodell hears all appeals—yes, the same man who gives out the punishments gets to assess, upon further reflection, whether his own punishments might have been excessive—and he didn't budge when Saints management appealed their suspensions. If there's a silver lining in this for New Orleans, it's that their defense sucked in 2011. According to Football Outsiders' DVOA rankings, the Saints' D ranked 28th last year despite their army of renowned defensive linemen (including Smith and Hargrove*) and spry linebackers. *Corrected: Hargrove wasn't on the Saints in 2011. He played for the Seahawks. Maybe their personnel shakeup could allow for some success. We can already count on some improvement, thanks to Gregg Williams's departure: his nutty, predictable blitzes hamstrung his team. Perhaps Steve Spagnuolo, the Saints' new, clever defensive coordinator, can thrive like he did with the Giants in 2008. He didn't have too many linebackers there. 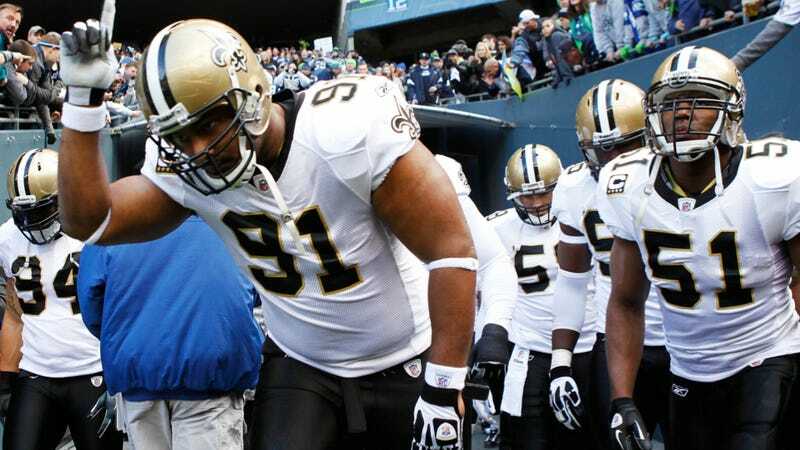 (He had lots of linemen, yes, but so do the Saints, even without Smith. Hell, their first pick in the draft last week—a third-rounder, thanks to a 2011 trade and a forfeited pick—was a defensive tackle.) No, Reggie Torbor's not a free agent, but Antonio Pierce is. Pick up the phone, Spags!